London - Natalie du Toit won her third gold medal in the pool in her swansong appearance at the London Paralympic Games on Thursday. Slow out of the blocks as usual, Du Toit improved with every length to win the women’s 200m individual medley by two clear seconds, in 2:34.22. “It’s the second-last race of my career, so it’s great to have that gold medal after such a struggle,” Du Toit said. “I always have a bad start, so I’m getting over that now. I actually practised my starts a lot before coming here and it’s still bad, so I just gave up on that. “It was quite a strange race because I went out in the butterfly and, when I touched for the backstroke, I saw myself on the big screen. “I watched myself go from a close up to a far view of all eight lanes. 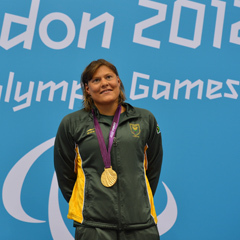 As the only leg amputee in the race, Du Toit said she knew would struggle in the breaststroke. “In this competition, I’ve been bad in backstroke and I know my competitors were all working towards catching me in the breaststroke. Du Toit said she could hear the South Africans in the crowd supporting her, but the host nation also gave her a good reception, despite her closest rivals in the race all being British. “I always had a great reception from the British crowd, ever since the Commonwealth Games in Manchester in 2002. I had a standing ovation then and coming here now, from race one to race six, has been special and I have to say thank you to them. “We also have a lot of South Africans in the crowd and that's been amazing. Du Toit, who lost her left leg below the knee in a scooter accident in 2001, was competing against Stephanie Millward, an able-bodied swimmer before she was diagnosed with multiple sclerosis at age 17, and Louise Watkin, born without a left hand. Millward took the silver medal in 2:36.21 and Watkin earned the bronze in 2:27.79. There was no going back for Du Toit, who will swim her last ever competitive race, the 100m freestyle S9 on Friday. “I’m sad but also relieved, as well as a little bit scared. I think scared because I have no idea what I’m going to do with myself. “I’m also nervous for the race because I’m not swimming so well and those girls have really improved, especially in the 100s and 50s. So, I’ve got to try my best to walk away with a medal and it will be very special being my last competition.